BLAEU - Taurica Chersonesus, Nostra aetate Przecopsca, et Gazara dicitur. BLAEU, W. - Taurica Chersonesus, Nostra aetate Przecopsca, et Gazara dicitur. Taurica Chersonesus, Nostra aetate Przecopsca, et Gazara dicitur. 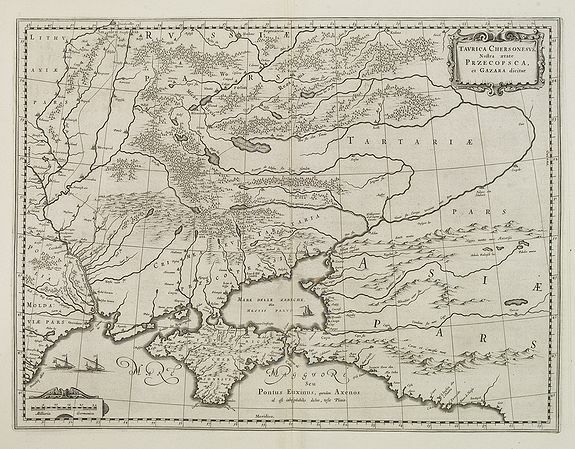 - BLAEU, W.
Title : Taurica Chersonesus, Nostra aetate Przecopsca, et Gazara dicitur.. Size : 14.9 x 19.5 inches. / 37.8 x 49.5 cm. Description :Part of Russia with in the north Smolensk and including Moscow and in the south the Black Sea. Condition : Good condition. Wide margin.